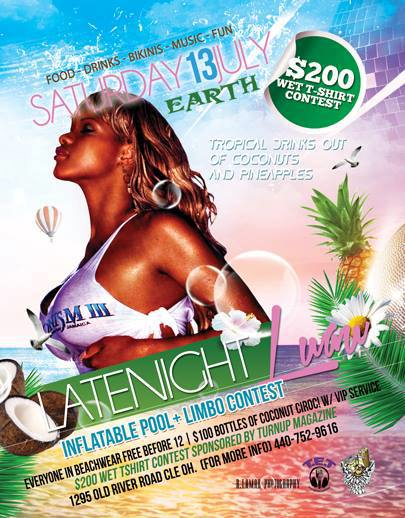 Late Night Luau at Earth Night Club | Summer Jam Saturday | July 13th | Inflatable Pool | Wet T-shirt contest sponsored by Turn Up Magazine – $200 cash prize | $100 bottles of Coconut Ciroc – drinks served out of Pineapple husks & coconuts | EVERYONE in a swimsuit gets in FREE BEFORE 12a | Photography sponsored by Roy Lamar of R. Lamar Photography | T.E.T. Entertainment will be in the building | TSC will be shooting footage for their new video | ‪#‎Food‬ ‪#‎Drinks‬ ‪#‎Bikinis‬ ‪#‎Music‬ ‪#‎Fun‬ YOU DEFINITELY WANT TO BE THERE!! !